A robust, full-throated, heartfelt performance with, appropriately, a large number of Slavs on board. Tatiana (Anna Netrebko) is a lovely, vulnerable young girl who takes one look at Eugene Onegin (Mariusz Kwiecien), a friend of Lenski (Piotr Beczala), her sister’s betrothed, and she falls madly in love with him. 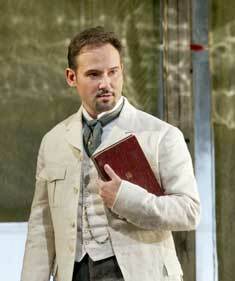 But, Onegin, something of a blase cad, will have nothing to do with Tatiana. Onegin, by being flirtatious enough with Olga, really pisses off Lenski who not only renounces their friendship, but challenges Onegin to a duel. Things don’t turn out so well for Lenski. Time passes, and Onegin shows up at an event in St. Petersburg, only to discover that Tatiana is married to the rich and influential Prince Gremin (Alexei Tanovitski). All of a sudden, Onegin decides he is passionately in love with Tatiana and tries to seduce her away from her husband, but, despite lingering affections for Onegin, she remains true. There is not a whole lot of plot here, but there were a whole lot of fantastic Slavic singers who made it tick. As well, the conductor, Valery Gergiev, a noted Russian opera conductor, pulled the whole group together brilliantly well, and richly passionate, plaintive tonalities echoed with just the right attenuation. The singing was, by and large, superb. Anna Netrebko can really belt it out, and the warmth and sonority of her voice, and that of Mariusz Kwiecien, who plays Onegin, were striking. 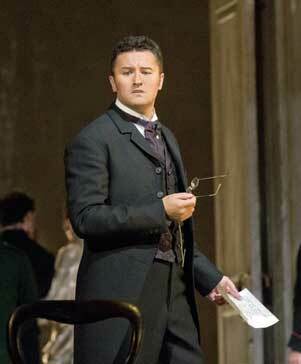 Piotr Beczala, a tenor, has a rich and lyrical voice and that also played very dramatically, though more with a kind of intensity and stridency, still lyrical and beautiful. The rest of the cast filled out the largely Slavic roster and maintained generally high levels of vocal sonority. 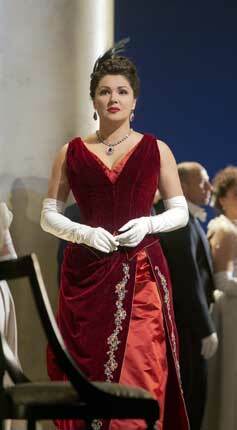 Netrebko, Beczala and Kwiecien are all compelling actors. Netrebko conveyed the deep pain of hidden love, Kwiecien the callow inadvertence of an alienated gentleman, and Beczala, the fiery, unsettled rages of jealously. Together they wove the vocal and dramatic strands that kept one’s attention riveted for the full four hours of the production. Amazingly, great music, great singing and great theatrical interpretation can turn a relatively simple tale into a dramatic masterpiece.